The baseball epitaph for Deadball Era right-hander Del Mason might well be the familiar: Minor League Star/Major League Bust. Twice the best pitcher of a minor-league circuit, Mason was a disappointment in ensuing trials with the Washington Senators (1904) and Cincinnati Reds (1906-1907). In retrospect, it appears that Mason lacked that extra level of pitching ability required for success against elite batsmen. Immaturity and a contentious disposition may also have worked against him. Then, while still a young man and a viable major-league prospect, Mason’s insistence on pitching Florida winter ball took the life out of his arm. He finished his pro career as a minor-league journeyman in 1914. But in the end, things turned out well for handsome Del Mason. Only weeks after he had thrown his final pitch in Organized Baseball, he married the only child of William Chase Temple, wealthy industrialist and one-time co-owner of the Pittsburgh Pirates. For the next five decades, the Masons enjoyed a comfortable but very private existence, living near-anonymously in their adopted hometown of Winter Park, Florida, until Del’s death in late 1962. 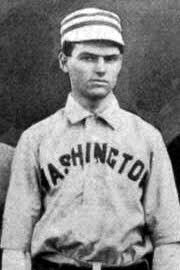 The young pitcher was headed for a (43-94) Washington club that had just finished last in the AL standings and was destined for a repeat in 1904, with an even worse record (38-113). The Senators showed their colors early, stepping off the new campaign by losing their first 13 games. Del Mason made his major-league debut in loss number 7, a complete-game 4-3 loss to New York on April 23. Notwithstanding the game’s outcome, Mason’s work was favorably reviewed. The Washington Post stated that he “had splendid control … and struck out five batters. At all times, [Mason] was as cool as a cucumber and fielded his position admirably.”14 Ten days later, an encore against New York did not go as well. Mason was hit freely in an 8-2 defeat (Senators consecutive loss number 12). His third start ended in an 8-7 loss to St. Louis on May 12. Still, the Washington Post remained an admirer, declaring that “Mason and [fellow rookie Beany] Jacobson have shown fine pitching quality, considering the fielding and batting support that has been accorded to them.”15 Sadly for Del, the club brass did not share the sentiment and sold his contract to the Baltimore Orioles of the Eastern League.16 In his brief rookie season, Mason had posted a 0-3 record, with a hefty 6.00 ERA in 33 innings pitched while yielding a .326 opponents batting average. A righty batter, he had been equally undistinguished with the lumber, having gone 0-for-15 at the plate. History repeated itself in 1905. As in the previous year, the Baltimore season was already underway by the time Mason assumed a place in the rotation. And again, he turned in first-rate work for a second-place (82-47) Orioles club. He threw 266 innings and went 18-11. But unlike the prior two falls, Mason went unclaimed in the minor-league player draft. Thereafter, his return to Baltimore for the 1906 campaign was beclouded by published report that he and Orioles left-hander Fred Burchall were bent on jumping to the Johnstown (Pennsylvania) Johnnies of the outlaw Tri-State League.29 But in April, Mason re-signed with Baltimore,30 and immediately proceeded to the zenith of his pro career. Del dominated Eastern League hitters, posting a sterling 26-9 record that led the league’s hurlers in wins and winning percentage (.743). This brought Mason’s cumulative four-year record to an exceptional 87-37 (.702) and certified him as a minor-league pitching star. Although this most recent display of Mason’s truculence gained him further press disdain,32 it did not diminish major-league interest in the young right-hander. Many clubs were reportedly interested in securing his services, but the Orioles had reached an agreement with the Cincinnati Reds that gave the National League club first call on Baltimore players. Shortly before the early-September date of the minor-league player draft, Mason was sold to the Reds.33 On September 25 Del made his Reds debut, throwing four scoreless innings in relief of Bob Ewing in a 9-7 loss to Philadelphia. The game’s outcome left the Cincinnati Post wondering if Reds manager Ned Hanlon regretted not having started Mason.34 But given the ball four days later, Mason was hit hard and unable to hold an early 3-0 lead, dropping a 7-3 decision to Boston. In addition to losing his only major-league decision of 1906, Del also kept his hitless at-bat streak alive. It now stood at 0-for-20. Mason went 6-1 in Jersey City livery and anticipated his recall to New York once the EL season concluded. But unbeknownst to him, his major-league career had reached its end. In parts of three seasons, he had accumulated a woeful 5-16 (.238) record, with a Deadball Era-lofty 3.72 ERA in 191 innings pitched. His walks/HBP total (83) exceeded his 65 strikeouts, while opposing batsmen had hit a healthy .286 off his servings. During the 1907 season, however, Mason had finally broken his schneid at the plate, managing the eight base hits that left him with a .125 lifetime major-league batting average. All things considered, Mason, a star at the minor-league level, had been a bust as a big leaguer. Mason’s arm refused to respond to treatment, making 1909 a lost season. He made only three appearances (one as a right fielder) for Jersey City. After posting a 0-2 record in six innings pitched,46 Mason was released.47 He then returned to Winter Park, where he added coaching the Rollins football team to his offseason duties.48 Del tried to come back in 1910, making brief and unimpressive stops in Toronto, Des Moines, and Newark before drawing his release. Against the odds, he returned to usefulness in 1911, going 8-9 for another bad (63-88) Jersey City club. But he was not the same pitcher as before, and no longer considered a major-league prospect. Mason returned to the Skeeters in 1912, going 9-12 for seventh-place Jersey City of the newly renamed International League. He then completed his professional career with respectable (12-9 and 12-14) campaigns for another IL also-ran, the Montreal Royals. By now Mason had achieved some hometown celebrity, having piloted Rollins to multiple Florida state championships. Admirers of the good-looking college coach included Dorothy Temple, the teenage daughter of coal, lumber, and fruit magnate William Chase Temple, also a former mayor of Winter Park. Although a lover of the game – Temple had co-owned the Pittsburgh Pirates in the early 1890s and had donated the object of postseason pseudo-championship play in the National League (the Temple Cup) from 1894 to 1897 – it is doubtful that Temple was thrilled with the budding romance of his only child and a washed-up minor-league pitcher some 13 years her senior. But on November 5, 1914 (Dorothy’s 18th birthday), she and Del Mason were married, the likely misgivings of the bride’s parents notwithstanding.49 The birth of children Carolyn (born August 1915) and William (January 1917) would complete the Mason family. Despite a new bride and an automobile-repair business in Winter Park, Mason signaled his intention to continue playing professionally in characteristic fashion: He filed a grievance against Montreal with the NAPBBL. Pursuant to the terms of his 1914 contract with the club, Mason demanded that he either be tendered a new contract at $350 per month by Montreal or be granted free agency. And for once, Mason prevailed, minor-leagues secretary John H. Farrell granting the relief sought.50 The point of the proceedings, however, is far from clear. Once formally released by Montreal, Mason never made another appearance in Organized Baseball and thereafter contented himself with playing the occasional game with Winter Park amateur nines. For the remainder of his long life, Del Mason guarded his privacy. His local celebrity and the prominence of the Temple name generated the occasional mention of the Masons on newspaper society pages.51 But for the most part the couple avoided the limelight, living in the kind of quiet and comfort afforded by Dorothy’s heritance.52 By 1935 Del Mason had given up working entirely, living off investment income.53 The only blight on family life was the death of 10-year-old son Billy in August 1927. By then, the well-to-do Masons had receded into virtual anonymity. The last-discovered trace of Del’s post-baseball life resides in the 1956 Orlando area directory, which lists him as vice president of a local library and a resident of Winter Park. As he grew elderly, Mason became afflicted with heart disease. In early December 1962, he developed a blood clot on the brain and died at home on New Year’s Eve.54 Adelbert William “Del” Mason was 79. His remains were interred next to those of his son in Palm Cemetery, Winter Park. He was survived by wife Dorothy and daughter Carolyn Mason Frid. Sources for the biographical information recited herein include the Del Mason file maintained at the Giamatti Research Center, National Baseball Hall of Fame and Museum, Cooperstown, New York; US Census, Florida directory, and Mason family posts accessed via Ancestry.com, and various of the newspaper articles cited below. Unless otherwise noted, stats have been taken from Baseball-Reference. 1 The other Mason children were William (born 1880), Lilla (1882), and Emma (1888, after her father’s death). 2 As per the 1892 New York State Census. 3 Contemporaneous reportage of Del Mason’s career in professional baseball often identified him as a native of Lockport, and Del himself claimed graduation from Lockport High School in the late-life player questionnaire submitted to the Hall of Fame library. But the 1900 US Census curiously identifies 16-year-old Adelbert W. Mason as a boarder in the home of Benson H. Roberts, the principal of a Methodist divinity school located in the Rochester suburb of Chili, New York. 4 An early report on Mason maintained that he “had a record of 12 shutouts in 15 games played in a collegiate league.” See Sporting Life, July 2, 1902. Beginning in the winter of 1905-1906, Mason served as baseball coach for Rollins College in Winter Park, Florida, but what the Sporting Life quote refers to is unknown. 5 As reported in the Worcester Spy, July 10, 1902, and Sporting Life, July 17, 1902. 6 As per the Worcester Spy, August 15, 1902, republishing a report from the Lockport (New York) News. 7 As reported in Sporting Life, August 23, 1902. That fall, Stallings would make an unsuccessful effort to sign Mason to a new Buffalo contract. See Sporting Life, October 25, 1902. 8 As per the Cleveland Leader, September 23, 1902, reporting a Mason pitching victory over an Ohio All-Star team, and the Cleveland Plain Dealer, October 19, 1902, noting postseason Mason triumphs over Rochester and Buffalo. 9 As reported in Sporting Life, November 22 and 29, 1902. 10 As reported in Sporting Life, May 23, 1903. 11 In the estimation of Sporting Life, April 9, 1904, Mason had been the best pitcher in the New York State League. 12 As per The Encyclopedia of Minor League Baseball, Lloyd Johnson and Miles Wolff, eds. (Durham, North Carolina: Baseball America, Inc., 2d ed. 1997), 138. 13 As reported in the Cleveland Leader and Washington Evening Star, September 22, 1903, and Sporting Life, September 26, 1903. 14 Washington Post, April 24, 1904. 15 Washington Post, May 14, 1904. 16 As reported in Sporting Life, May 28, 1904. 17 As per NAPBBL Bulletin No. 14, issued June 3, 1904, and reported in Sporting Life, June 18, 1904. See also the Boston Herald, June 24, 1904, and the Baltimore Sun, June 26, 1904. 18 As per the Baltimore Sun, June 26, 1904. 19 As reported in Sporting Life, July 2, 1904. 20 As reported in the Baltimore American, June 27, 1904. 21 As per final Eastern League statistics published in Sporting Life, December 17, 1904. Baseball-Reference provides no data for Mason’s 1904 tour with Baltimore. 22 The local press responded by taking delighted note of every unsuccessful Mason pitching effort. See, e.g., the commentary of West Coast correspondent H.G. Lowry in Sporting Life, January 5, 1905. Years later the local press still had not forgotten Mason’s putdown of the PCL, with one newspaper labeling him “a swell-headed box artist.” See the (Portland) Oregonian, March 15, 1908. 23 Seattle Times, December 1, 1904. 24 As related in an article authored by Mason for the Los Angeles Herald-Examiner, November 31, 1904: “Elusive Spit Ball Deceives Players; Pitcher Mason Tells How the New Twister Is Thrown.” If actually written by Mason (as opposed to some ghostwriter), the piece reveals considerable insight and sound judgment for someone of his age. 25 As per Sporting Life, November 19, 1904. 26 As reported in the Omaha World-Herald and Philadelphia Inquirer, February 21, 1905, and the (Jersey City) Jersey Journal, February 23, 1905. 27 As reported in the Baltimore American and Washington Evening Star, April 5, 1905, and Sporting Life, April 15, 1905. 28 As reported in the Baltimore American and Baltimore Sun, April 28, 1905. 29 As reported in the Baltimore American, February 18, 1906, and Sporting Life, March 3, 1906. The previous summer, Orioles pitcher Lew Wiltse had jumped to the Tri-State League, whereupon Baltimore management had apportioned the departed Wiltse’s monthly stipend among Mason, Burchall, and other loyal staff members. Baltimore’s refusal to maintain Mason and Burchall at the supplemented 1905 salary rate was believed to be the cause of the two pitchers’ discontent. 30 As reported in Sporting Life, April 26, 1906. Fred Burchall also re-signed with the Orioles for the 1906 season. 31 As reported in the Baltimore American, August 28, 1906, and Washington Post, September 2, 1906. 32 The Boston Post, for example, reproached Mason with the observation that “fresh ball players don’t get by very well,” as reprinted in Sporting Life, October 13, 1906. 33 As reported in Sporting Life, September 1, 1906. 34 Cincinnati Post, September 25, 1906. 35 In the late-life questionnaire that he completed for the Hall of Fame library, Mason claimed a degree in Business Administration from Rollins College, but it seems improbable that he was actually a student at the school. The Florida state championship was a newspaper honor conferred upon the winner of the most games played between Rollins, the University of Florida, Stetson University, St. Augustine College, and other local schools. 36 Cincinnati Post, May 23, 1907. 37 As reported in the Cincinnati Post, May 28 and 29, 1907, and Sporting Life, June 8, 1907. 38 See the Baltimore Sun, September 2, 1907, Jersey Journal, September 3, 1907, and Sporting Life, September 7, 1907. The commission ruled, reasonably, that Mason had failed to establish a cause of action against the Cincinnati club. 39 Veteran Cincinnati sportswriter Ren Mulford Jr. observed that “the Reds are not a happy family. Half the team does not like Hanlon [and] neither [pitcher Jake] Weimer nor Mason has any use for” the club manager. Sporting Life, July 20, 1907. 40 As reported in the Cincinnati Post, August 19, 1907, Pawtucket (Rhode Island) Times, August 20, 1907, and elsewhere. 41 As reported in Sporting Life, August 31, 1907. 42 As reported in the Jersey Journal, September 3, 1907, and Sporting Life, September 7, 1907. 43 As noted in Sporting Life, January 18, 1908. 44 As per the Jersey Journal, September 21, 1908, which noted that Mason had “made himself very popular by his consistent work and will receive a hearty welcome from his admirers” when he returned to Jersey City the next April. 45 As per the Jersey Journal, April 30, 1909. 46 As per the Jersey Journal, June 14, 1909. Baseball-Reference provides no 1909 data for Mason. 47 See the Jersey Journal, June 17, 1909, and Sporting Life, June 26, 1909. 48 As per the Tampa Tribune, October 24, 1909. 49 Perhaps ironically, William Chase Temple himself was married to the daughter of an old ballplayer. Wife Carrie Wood Chase’s father was pioneer era star Jimmy Wood. 50 As reported in Sporting Life, July 15, 1915. 51 Such mentions appear largely confined to the Tampa Tribune. Archivists at the Winter Park Public Library were unfamiliar with Del Mason, and no mention of his name was discovered in back issues of the Winter Park weekly newspapers of Mason’s time. 52 William Chase Temple died in January 1917, his wife, Carrie, in June 1924. As an only child, Dorothy Temple Mason would have inherited the substantial Temple fortune. 53 According to the 1935 Florida State Census. Almost 30 years later, his death certificate listed Mason as the owner of an auto company. 54 Mason’s death certificate cited cerebral thrombosis as the immediate cause of death. Arteriosclerotic cardiovascular disease was given as the underlying basis.